It’s an extra large cartoon, drawn on a 12″ x 12″ sticky note! 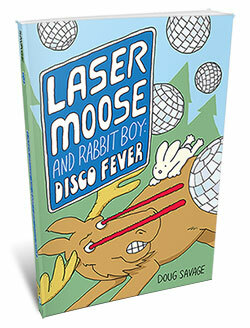 Click the cartoon to see the larger version. And here’s more Star Wars. lol, that’s awesome! who would have thought that Chewie said so much throughout the film. A masterpiece! You’ve really caught the subtlety of chewys performance. Well done. He doesn’t usually get the recognition he deserves. Chewbacca has to be my least favourite movie character in history. Yes, worse than Jar Jar. Is that a surprised fast food hamburger box in #21? I don’t remember the scene the 17th clip is from…. I was about to call you out on the second to last one where Chewie is standing at a podium narrating a PowerPoint presentation, and then I realized he was just carrying some booty. Brilliant! Now, could you do the same for R2D2? [1 favorite -] Favorite added! love it. his speech touched my heart *snifF*. 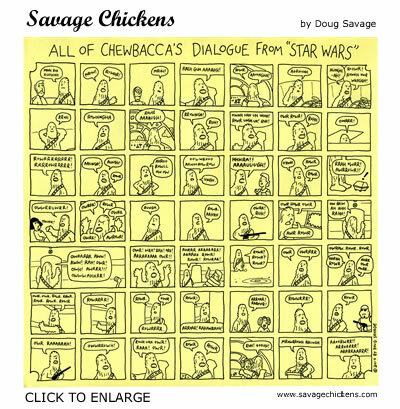 I just love love love savage chicken….I share this comic strip with everyone! Love Love Love my savage chicken! Thanks everybody for all the great comments! @Nysssssa: The 17th bit of dialogue happens just after Luke tells Han, “She’s rich…” – Chewie does not approve! This may go without saying since you draw comics for a living but…you have too much time on your hands. At least you put that time to amusing the rest of us. Can’t imagine how tedious this was. I want to buy this, frame it, hang it on my wall and pass it down to my ancestors for all time. It is fantastic! What do you do with these big ones Doug? Please don’t say you just file them away – this belongs in a gallery! hahaha! Yea who would have suspected there was that much Chewy chat. Awesome 🙂 The OCD nerd inside me is wondering if you sat down and wrote down all Chewie’s scenes? Ian C has a good point, what happens to the originals Doug? @Tom Horn: Yes I went through the whole movie and meticulously wrote down everything Chewie said. A crazy thing to do, but once I got started I was determined to do it right! @steve, @Ian C: Maybe it’ll be in a gallery someday, but for now the original is safely tucked in between two old LP sleeves. Thanks again to everybody for the great comments, and for sending this cartoon around to so many people. Much appreciated! This needs to be a poster, please? You’ve lured me back out of lurk-dom with this one Doug. Truly epic…the best use EVAR of a 12″ by 12″ sticky–where the heck do you get those, anyway? Your impressive act of fandom is more than the sum of its parts, though. I agree with the others, this is not mere cartoon, this is art. This should be an album cover. Wierd, after reading that, I can hear his voice in my head still. He’s been reincarnated as a voice worm. Stunning accuracy. Did you spend all long weekend on this one? Not much left for me to say except, I vote for a tee-shirt in addition to the poster! how long did it take you to do this? Definitely make more! I would like to buy a poster print as a present for someone! Would love to buy a print of this for my husband. If you make this available as a print, please let me know! Thx. I think rownngha is spelled with another ‘h’ in there somewhere, though it’s been a while since I took that exchange semester on Kashyyyk. You mean he didn’t say anything when he had C3P0 in parts on his back? I coulda sworn he said something. Chewbacca is hilarious and serious at the same time! Drinks on me!